" your prices are better than buying in the store." 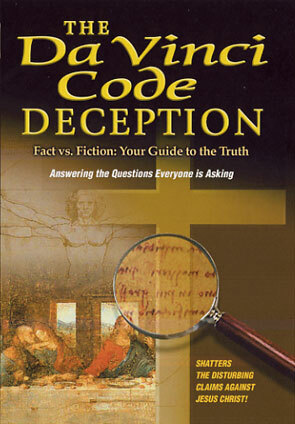 For the readers of "The Da Vinci Code..."
Based on three best-selling books - The Da Vinci Deception, Breaking the Da Vinci Code, and Cracking the Da Vinci Code - this program solves a 2000 year-old mystery and sustains your faith in Christianity! This docu-drama answers all the lingering questions and exposes all the deceptions in Dan Brown's novel - through interviews with book authors and the world's leading experts in theology, archeology, art history, philosophy and science. Heroes Mickey and his best friend, Sully, are forced to take on a mission to save our country from the evil plans of Admiral Ironsides. Come with us on a journey around the world as we visit stunning Cathedrals and Churches in order to unveil the secrets they hold. FICTION: The marriage of Jesus and Mary Magdalene. (Chapter 58, page 244). FACT: The Holy Bible says that there will be those who "...spread error concerning the Lord...." (Isaiah 32:6). FICTION: Mary Magdalene..." The prostitute? "(Chapter 58, Pages. 243-244). FACT: The Holy Bible does not indicate that Mary Magdalene was ever a prostitute. The Holy Bible reveals that she was demon possessed, in that the Gospel of Luke describes her as a woman "from whom seven demons had gone out." (Luke 8:1-3). FICTION: Dan Brown further writes: "...almost everything our fathers taught us about Christ is false." (Chapter 55, Page 235). FACT: The Holy Bible warns us that there will be those "...exchanging the truth of God for a lie,...."(Romans 1:25). Useful and informative primer on the "Davinci Code" apologetic. However, must upgrade to the "closed captioned" format for those of us with hearing loss, this would be a tremendous help.